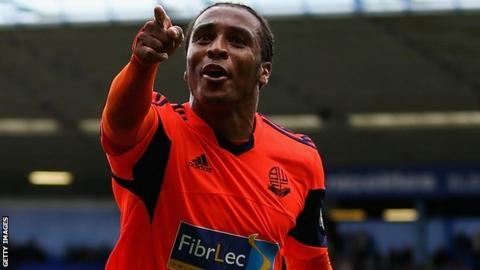 Bolton made it eight league away games without defeat as they comfortably beat Sheffield Wednesday. The visitors raced into a three goal lead inside half an hour, with Neil Danns bundling in a Jermaine Beckford cross for the opener. Lee Chung-yong pounced on a defensive mistake to race clear and add a second before Liam Trotter scored with a dipping long range effort. Joe Mattock pulled one back for the Owls but they rarely carried a threat. Wednesday have now won only one of their last seven games, although like Bolton they are safe from relegation with the play-offs well out of reach. Both sides traded chances before Beckford did well to get to the byeline and put the ball across the face of goal, with Danns applying the finishing touch for the opener. Lee added to the lead before the home side's Rhys McCabe had a firm low drive saved. Trotter put Bolton further ahead before Mattock reduced the arrears with a fine strike, hammering the ball beyond keeper Adam Bogdan following a corner. Bolton continued to look the more dangerous side and the Owls had keeper Chris Kirkland to thank for not suffering a bigger loss. "It was very convincing. I felt that we had to make sure the first 20 minutes were done properly in terms of game plan and attitude because we were aware that Sheffield Wednesday would try to spring themselves into action. "I felt that we were right on our game and deservedly went three goals up. We passed the ball very well from the back and through midfield. "The hunger and desire was there as well. If anything, we probably should have scored more goals in the second half." "It looks like we're going to need four goals to win any game at the moment because we're gifting goals with individual errors. "Our quality on the ball should have been a lot better. If I was to evaluate the season, I'd say the first 18 games were very poor and from December onwards it was better. "We've now got dragged back down to being very poor again, which is disappointing." Match ends, Sheffield Wednesday 1, Bolton Wanderers 3. Second Half ends, Sheffield Wednesday 1, Bolton Wanderers 3. Substitution, Bolton Wanderers. Thomas Youngs replaces Lee Chung-Yong. Corner, Sheffield Wednesday. Conceded by Oscar Threlkeld. Attempt blocked. Caolan Lavery (Sheffield Wednesday) right footed shot from the left side of the box is blocked. Assisted by Benik Afobe. Attempt blocked. Lee Chung-Yong (Bolton Wanderers) left footed shot from outside the box is blocked. Assisted by Andy Kellett. Corner, Bolton Wanderers. Conceded by Kieran Lee. Attempt missed. Lee Chung-Yong (Bolton Wanderers) right footed shot from the centre of the box is close, but misses to the right. Assisted by Andy Kellett. Offside, Bolton Wanderers. Lukas Jutkiewicz tries a through ball, but Neil Danns is caught offside. Substitution, Sheffield Wednesday. Benik Afobe replaces Giles Coke. Attempt missed. Jeremy Helan (Sheffield Wednesday) left footed shot from the left side of the box is too high. Assisted by Michail Antonio. Attempt saved. Neil Danns (Bolton Wanderers) right footed shot from the centre of the box is saved in the bottom right corner. Assisted by Lukas Jutkiewicz with a cross. Substitution, Bolton Wanderers. Andy Kellett replaces Jermaine Beckford. Attempt missed. Michail Antonio (Sheffield Wednesday) right footed shot from the left side of the box is too high. Attempt missed. Atdhe Nuhiu (Sheffield Wednesday) left footed shot from outside the box misses to the right. Assisted by Giles Coke. Attempt saved. Jeremy Helan (Sheffield Wednesday) left footed shot from the left side of the box is saved in the bottom left corner. Assisted by Michail Antonio. Substitution, Bolton Wanderers. Lukas Jutkiewicz replaces Robert Hall. Offside, Bolton Wanderers. Matthew Mills tries a through ball, but Neil Danns is caught offside. Attempt blocked. Neil Danns (Bolton Wanderers) left footed shot from a difficult angle on the left is blocked. Assisted by Tim Ream. Foul by Paul Corry (Sheffield Wednesday). Attempt blocked. Caolan Lavery (Sheffield Wednesday) right footed shot from the centre of the box is blocked. Assisted by Jack Stobbs with a headed pass. Substitution, Sheffield Wednesday. Paul Corry replaces Rhys McCabe. Substitution, Sheffield Wednesday. Jack Stobbs replaces Joe Mattock. Attempt missed. Robert Hall (Bolton Wanderers) left footed shot from outside the box is high and wide to the right from a direct free kick. Oguchi Onyewu (Sheffield Wednesday) is shown the yellow card. Jermaine Beckford (Bolton Wanderers) wins a free kick in the attacking half. Attempt blocked. Giles Coke (Sheffield Wednesday) right footed shot from outside the box is blocked. Assisted by Atdhe Nuhiu. Adam Bogdan (Bolton Wanderers) wins a free kick in the defensive half. Attempt missed. Lee Chung-Yong (Bolton Wanderers) right footed shot from the centre of the box is too high. Assisted by Robert Hall with a headed pass. Oscar Threlkeld (Bolton Wanderers) is shown the yellow card for a bad foul.